Bangalore, obviously, must have several Blood Banks where volunteers can donate blood which will then be used during emergencies. I know of the Blood Bank that the TTK group runs, it is ably managed by Lakshmi Ravichandran. 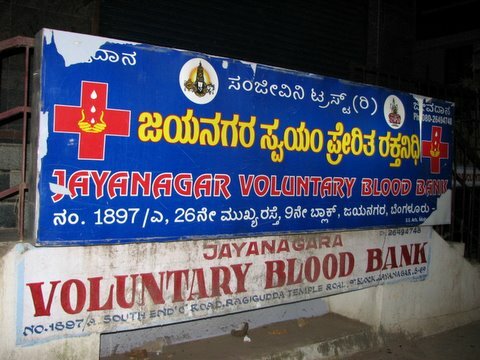 What are the guidelines that govern the setting up of a Blood Bank in Bangalore? How do the administrators ensure that the blood is stored properly and does not lose its viablity? I will be going to this Blood Bank and asking a few questions, but meanwhile…if anyone has some info, that would be welcome!